Do you ever find yourself in this place round-about lunchtime: you haven’t even gotten through math yet, breakfast dishes are still around, that important phone call yet hasn’t been made yet, and everyone is more than a little bit done with the day already? Me too. Like . . . a lot. Until I figured out a system to starting my homeschool day right. Once I began doing these few simple things, I had a much better attitude and a MUCH more productive morning. And then I began bringing more positivity and enthusiasm to my homeschooling. These habits have made an incredible difference in my day. When I start my day off right, not only do my children get a happier, more patient momma–they get a day structured with their best interests in mind too. I am not just rushing around playing catch-up and trying to tick the next item off my to-do list. I am thoughtfully spending time with them and enjoying the moment. And it all begins at the beginning. Here are the habits I try to consistently stick to. I set a positive tone the second I open my eyes. As homeschooling moms, we have unique pressures and responsibilities in addition to all those that come with mothering already. And it is so easy to let these things rush to the front of our minds as soon as we wake up. Instead, I try to make a conscious effort to prepare my mind with peace and clear-mindedness to meet what lies in store for me that day. Since the first thing I do is grab for my phone to turn off the alarm, there are many temptations as far as what to look at next. Weather, news, to-do lists, e-mail, social media? And when I start my day with any of these things it is never a peaceful start. Even if these things aren’t bad news–letting them be the first things in my mind does not instill a sense of peace and purpose. But my phone can be a wonderful tool to start the day right too. Even if I don’t have time to do a full Bible study as soon as I wake up, I try to make a Bible verse the first thing I read each morning. When I shut off my alarm I have an app with a new verse at the ready. I pause and meditate on what that verse is speaking to my heart that morning. And I have begun the day on the right foot before I even get out of bed. I also have a quotes app on my phone so that I can follow up my verse with an inspiring and motivating quote. News and e-mail can wait . . . at least until after coffee. There are many other ways to work positive affirmations into your morning routine. Recently, I shared my short-list of favorite Bible Verses for a Homeschooling Mom. These are the ones that I turn to, time and again, for encouragement and reminders that I have an ever-present Helper in my time of need (which is all the time). To bless your morning, I created a set of note cards with these verses (download them at the end of this post) that you can put on your bathroom mirror, your coffee pot, or wherever you will first see them to help start you day right. I also made journaling pages to accompany them so that you can write or sketch about what they are speaking to your heart. And there are blank cards and journaling pages so you can add your own favorites. I get myself PUMPED UP and excited for the day! OK. We have all heard this advice a few times. But it’s so true. You cannot give anything to your children if you don’t, first, possess it yourself. This includes patience, joy, enthusiasm, happiness, peace. And this applies to your homeschool day as well. Whatever your vision of the perfect homeschooling day looks like, you better spend a little time cultivating that for yourself if you ever hope to see it. spending a little time outdoors. One thing I love to do each morning that really gets me ready for our homeschool day is spending ten or fifteen minutes reading motivational books, particularly about leadership, even business leadership. After all, we are the CEO’s of our home. And we have a workforce of tiny people that we expect to show up each day, put forth their best effort, and be aligned with our vision for the future. I have found bringing business techniques for inspiring, leading, and motivating into my homeschool revolutionary. It really helps me get excited about our day. And it reminds me of the importance of my attitude in motivating them. Then I can authentically bring that enthusiasm to my children. Ten minutes to half an hour of happy time for mom is not too much to ask. Your kids will thank you for it. Begin to train them that there is a time in the morning when they color, eat cereal, play quietly, whatever, so that you can do what you need to do for you. Then when you give your time to them it is fully giving–abundantly and enthusiastically giving. I establish a workable morning routine and stick to it. I would be lost without my routines. For me, they work way better than schedules. With a schedule, where you have a specific time slot for everything, it is so easy to feel behind. But with a routine you’re never really behind. Getting back on track is as easy as just doing the next thing. My routine gets me and my home ready for a kick-booty day. Not that we don’t have those school-in-our-jammies days too. But they are that much more enjoyable when they’re a special treat. I get dressed–nothing fancy–but, hey, it’s dressed. My hair and teeth are brushed. Enough to make me feel put together. I don’t start school with that just-rolled-out-of-bed feeling. Back to the CEO analogy–I want to come to my “job” awake and alert and setting the example for my kids that I am showing up and I expect them to. And my home has a get-ready routine too. I quickly hit each room and just do the basics. Beds are made, dishwasher emptied, out of place items tidied. I feel like if I begin school without these basics done I am perpetually behind the rest of the day. This is a great opportunity to instill the routine habit in your kids too. My six-year-old has her own morning routine now, written in her little notebook. She loves to go down the list and check off each item as she does it. As she learns the habit of routine, it takes even the task of reminding her to get ready off of me. I plan my day ahead using my List of Threes. Boy, do I love lists. And the most helpful type of list I make is the informal one I scribble out every morning. It is my List of Threes and it’s a different sort of creature that tremendously helps me to actually get things done . . . besides just making lists. Here is what you do. phone calls, business items–everything. Not fancy or neat. You’re about to butcher it anyway. Now do three things. have to–and that’s the point. Come on now. Pick three. morning/early afternoon/late afternoon. And those are your checkpoints. business. So pick your checkpoints, set your alarm, and . . . GO. And there you have. The List of Threes. Don’t just get more things done. Get more important things done. I know my children’s “prime time” for learning. I’ve talked a lot about getting mom ready to bring her best to the homeschooling day. And since mom is the leader that really is vitally important. But the kiddos need to be in their happy places too. Kids seem to have a sweet spot somewhere between “I just woke up” and “I’ve been up for too long” that is the right time to get them to sit down and engage with school work. When I miss this window it is always way harder to get everyone on board. Your kids will differ from mine on when that is and how to get there. And sometimes I am so busy with my routines and lists that I forget to be intentional about preparing the children to bring their best as well. Here are some things to focus on to help everyone have a great start. with a reasonable bedtime and peaceful wind-down routine. begin. They can’t concentrate hungry. was homeschooled I went through a phase of being most ready to focus and work in the evening. Try to give some preferential consideration to what time works best for your kids to learn, even if it isn’t your best time of the day. It will change over time and I try to be flexible on this one. To sum it all up, getting the best start to my homeschool day is all about keeping it positive, staying on routine, and throwing out anything that is just not working. And the biggest indicator of what kind of school day we’re going to have? How much energy and enthusiasm I bring to it. So do what you need to do to motivate yourselves, Mommas. I’m including for you my printable note cards and journaling pages of Bible Verses for a Homeschooling Mom. I hope they bless you as much as they have me. I also included blank cards and pages for you to add your own favorites. fresh so I always love to hear what other people are doing. Have a blessed and happy homeschooling day! Download the Bible Verses for a Homeschooling Mom! Download these FREE Bible verses printable cards to help you start your day on the right foot! 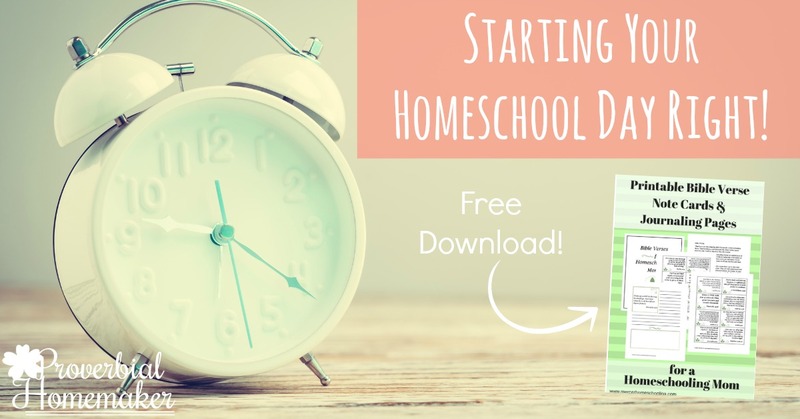 Note: Signing up to download this form will subscribe you to ProverbialHomemaker.com and MercerHomeschooling.com. Thank for sharing this valuable information, I alway enjoy reading your articles.